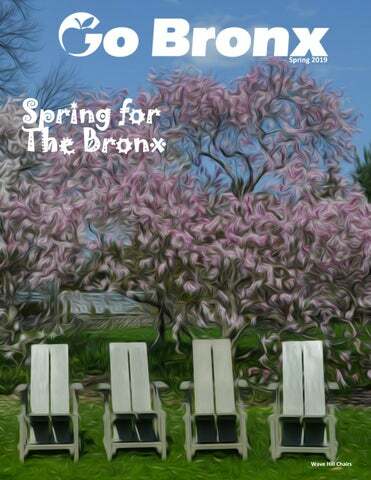 It is with great enthusiasm that The Bronx Tourism Council launches its first official seasonal Go Bronx Magazine! In this issue you will find a calendar of events and a few interesting articles written by some of our cultural partners. As the weather gets warmer, tourism season kicks off and we are thrilled to be on your top list of destinations. Between the new Dinosaur Safari at the Bronx Zoo, the annual Orchid Show at the New York Botanical Garden, or concert tributes and museum exhibits, there is plenty to experience in New York City’s most northern borough. Tiffany Peluso Consultant 851 Grand Concourse, Ste. 123 Bronx, NY 10451 718.590.3518 www.ilovethebronx.com Go Bronx Magazine is a digital publication of The Bronx Tourism Council (BTC). Contents and design © 2019, all rights reserved. Reproduction or alterations without written permission is strictly prohibited. Every effort was made to ensure accuracy of the information in this guide as of press time. However, BTC assumes no responsibility for errors, changes or omissions. BTC makes no endorsement, representation or warranty regarding the suitability, quality or availability of any goods or services advertised or listed in this publication. Listings and advertisements may have been provided by the subject companies and BTC shall not be responsible or liable for any inaccuracy, omission or infringement of any third party’s rights therein, or for personal injury or any other damage or injury whatsoever. April 6 | 8PM NOCHE CALIENTE: FRANKIE NEGRON, ROBERTO BLADES, & BRENDA K’ STARR Special night with three Salsa stars known for performing some of the best Salsa the world has to offer. Hard to resist Frankie Negron’s blend of genres like R&B and pop into Salsa, Ruben Blade’s Salsa hits such as Lagrimas, Flor Dormida, Si Estuvieras Conmigo, and the multitalented Brenda K Starr’s unforgettable hits such as Herida. April 6 | 7:30PM A TRIBUTE TO DAVE VALENTIN An exciting double bill – a tribute to the late flutist Dave Valentin led by his former music director, pianist Bill O’Connell, with flute virtuoso Andrea Brachfeld plus the debut of Bill O’Connell's latest project (ACE). April 11, 17 @ 2PM | Apr. 12 @ 7PM |Apr. 18 @ 12:30PM IN REAL LIFE The world premiere of Stacie Lents’ tragicomedy In Real Life, in which two high school students, who live in the post-Trump future when the world has gone completely virtual, rebel against cyber reality and attempt to connect to an actual world they have never known. April 13 | 8PM LA SOPHY & FAUSTO REY After more than FOUR decades the international artists of several generations will meet for the first time at the prestigious Lehman Center in The Bronx, to present what will undoubtedly be the biggest concert of 2019. April 27 | 8PM STAR DUST, A DAVID BOWIE TRIBUTE After a year on tour and a triumphant run at Broadway’s, Joyce Theater, Complexions Contemporary Ballet brings this powerful, loving and emotional tribute to David Bowie’s musical career! April 26 | 7:30PM JAVIER PADILLA & THE MOVEMENT PLAYGROUND Javier Padilla is an emerging choreographer, dancer, pilates instructor and movement artist interested in utilizing innovative technological and marketing strategies to enhance artist visibility and creating works. May 11 | 8PM ANDY MONTAÑEZ 55TH ANNIVERSARY Andy Montanez will be joined by several of Puerto Rico’s most illustrious talents: Victoria Sanabria, El Trio Ideal, Johnny Olivo & Herencia De Plena. Come see him perform at Lehman Center! May 2 | 7:30PM MACHITO AND BEYOND WITH THE CARLOS HENRIQUEZ ENSEMBLE The acclaimed bassist for Wynton Marsalis, and a respected bandleader in his own right, explores the impact of Machito on Latin jazz as well as a youthful take on some Machito classics and Graciela favorites. May 3 | 6:30PM MACHITO AND MARIO: THE ROOTS OF AFRO-CUBAN JAZZ Noted Latin Music historian Joe Conzo, Sr. guides you through the exhibit developed and on loan from the National Jazz Museum in Harlem. May 3 | 7:30PM MACHITO: A LATIN JAZZ LEGACY In a career that spanned half a century, this Cuban bandleader embodied Latin Jazz and influenced several generations of musicians. May 4 | 7:30PM THE MACHITO ORCHESTRA Mario Grillo, aka Machito, Jr., leads a program of Machito hits including “Cuban Fantasy” and “Mambo Inn” as well as some rare gems for this historic concert. FOR MORE INFO CLICK HERE! Concourse. Situated on the southeast corner of East 161st Street, the entrance is eye-catching. Rising to a height of fifteen feet is a concave wall of gold mosaic tile highlighted by horizontal ribbons of black and white. Centered exactly in the middle of this design is a revolving door over which are the numbers 888 that hint to an Egyptian influence. A Terrazzo tile circular design entry floor coupled with a corresponding canopy complete this high-profile location. Lobbies are a building’s “living room.” They offer a lasting first impression. Art Deco lobbies generally opted for intricate Terrazzo flooring that captivates the eye, often serving as a way to direct you to where it is you’re going. Use of low-rise stairways creates a sense of space even if the actual area is not all that spacious. Other key components of an Art Deco lobby include etched mirrors of blue glass featuring an actual bucolic scene that was cut directly into the mirror itself. During the Great Depression President Franklin D. Roosevelt commissioned the inclusion of grand murals in just about every public building. As such, many privately constructed Art Deco buildings also featured a mural. Some were painted, while others might be composed of small mosaic tiles. Elevator doors were always special. Some were polished brass or steel, but the most memorable were painted with elaborate designs of contrasting colors. Off the boulevard at East 162nd Street, architect Marvin Fine designed 1005 Jerome Avenue with a lobby of enormous proportions that is only surpassed by the fact this building occupies four acres of property and at one time boasted two full service lobbies on two different avenues. As bold and different as was Art Deco design when it was introduced to New York City in 1925, when World War II commenced in 1941 virtually all construction halted. With that, the Art Deco era abruptly ended, never to be revived. So too, never again would any future decade see the population of the borough increase by more than 128,000 people as it did during the 1930’s. 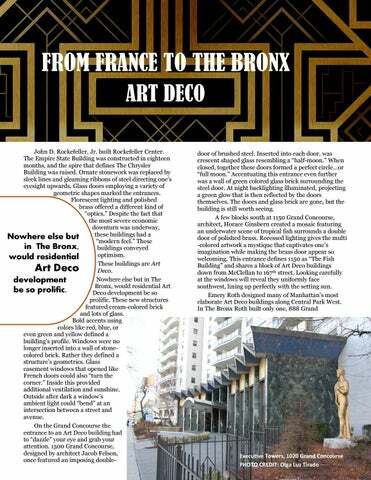 It was the decade of Art Deco in The Bronx! Sam Goodman is Bronx-born and has worked for The Bronx Borough President’s Office as an urban planner since 1995. He also offers a “Grand Concourse Stroll Into History” Walking Tour. Prepare for the biggest, most realistic Dinosaur Safari ride in America. Dinosaur Safari is back at the Bronx Zoo! Over 40 life-size, animatronic dinos have taken over the park. April 19 - November 3. Buy your tickets here! 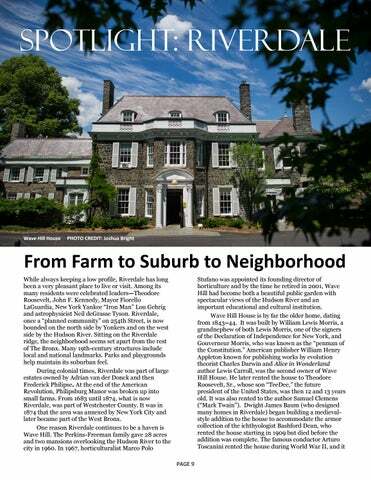 From Farm to Suburb to Neighborhood! 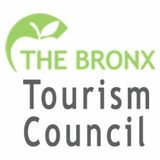 Learn about a Bronx community. Learn about the history of Art Deco Architecture in The Bronx.